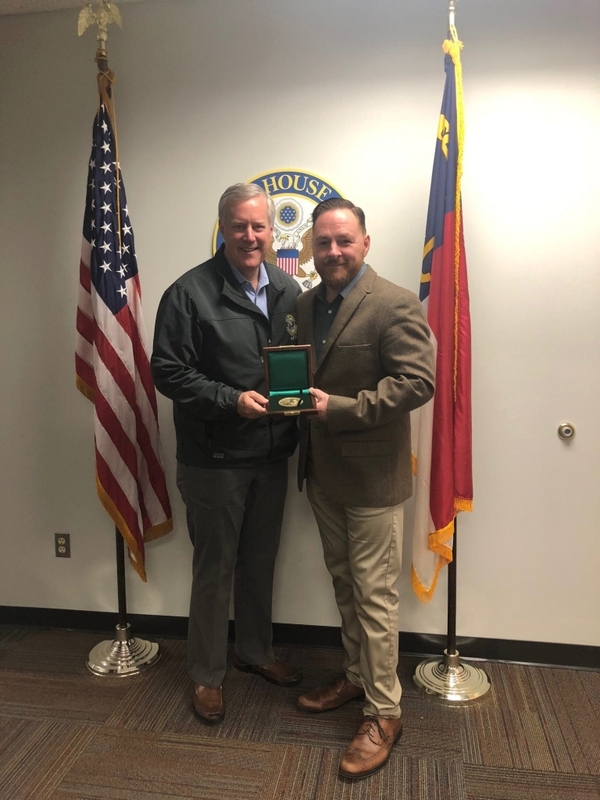 U.S. Rep. Mark Meadows, left, presented the Carnegie Medal to Carnegie Hero David Scot Love Oct. 23 at his Henderson, N.C., district office. Love, 41, of Flat Rock, N.C., ran to the scene of a burning car, where the semi-conscious driver was trapped inside. Love opened the front, passenger door and attempted to pull her free, but the 22-year-old’s legs were trapped near the burning engine compartment. Love briefly stepped from the car, still holding the woman’s hand, got a breath of air, and re-entered. By then the woman had freed her legs, and Love pulled her to safety.